In the first half of the 20th century an American couple from Kansas named Martin and Osa Johnson captured the public's imagination through their films and books of adventure in exotic, far-away lands. Photographers, explorers, naturalists, pilots and authors, Martin and Osa studied the wildlife and peoples of East and Central Africa, the South Pacific Islands and British North Borneo. They explored then unknown lands and brought back knowledge of civilizations thousands of miles away through their films, writings and lectures. From 1917-1936, the Johnsons set up camp in some of the most remote areas of the world and provided an unmatched photographic record of the wildernesses of Africa, British North Borneo and the Solomon and New Hebrides Islands. Their equipment was the most advanced motion pictures apparatus of the day, some of it designed by Martin Johnson himself. When the young adventurers left their home in Kansas to explore and photograph these lands, little did they realize that they would provide the world with a photographic record of the African game of unimagined magnitude and beauty. The Johnsons gave the filmmakers and researchers of today an important source of ethnological and zoological material which would otherwise have been lost. Their photographs represent one of the great contributions to the pictorial history of the world. Their films serve to document a wilderness that has long since vanished, tribal cultures and customs that ceased to exist. 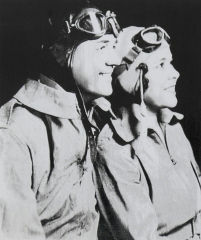 Among their accomplishments is their work as pioneer aviators. Taking adventure travel up a notch, in 1932 the Johnsons purchased two Sikorsky amphibian airplanes, a twin engine S-38 BS, painted with zebra stripes and named Osa's Ark, and a giraffe-spotted single engine S-39CS named Spirit of Africa. The planes were flown from the Sikorsky factory in Stratford, CT, to the Brooklyn docks and then hoisted aboard the City of New York. The sea voyage to Cape Town, South Africa, lasted from Dec. 31, 1932 to Jan. 23, 1933. They reached Nairobi, Kenya on February 8, 1933 despite 4,400 miles of dense fog, heavy rains, mountainous terrain, and expensive but nearly useless maps. 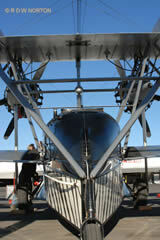 The two craft were then reassembled and readied for an unprecedented aerial safari. Using Nairobi as a base of operations, they coordinated trips across east Africa This safari was quite a departure from the Johnsons' earlier ones; with a small African ground crew, they established a series of basic airfields at strategic points allowing them to reach remote areas of Africa without the large number of porters required in previous safaris. At Garba Tula near the Lorian Swamp in eastern Kenya, they filmed the now well-recognized scenes of an immense herd of elephants. In September 1933 Martin and Osa made a return visit to the Mbuti peoples of the Ituri Forest who they had previously filmed during their Congonuia trip of 1930-1931. An improvised landing field was built at Gombari in the eastern Congo where they were greeted by 200 of the local natives. Using newly constructed runways at Nanyuki, the Johnsons' party in January 1934 became the first to fly over and film from the air Mt. Kenya. Similarly, they used as a runway the dry lake bed of Lake Amboseli in southern Kenya to film Mt. Kilimanjaro. Because of concern for Osa's health the Johnsons decided to conclude their trip. 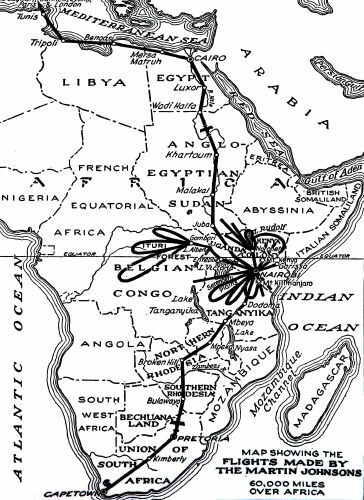 They left Nairobi on July 15, 1934 for London following the Nile Rtver to Egypt, than across north Africa and France. They returned to New York City on August 9 aboard the S.S. Manhattan. Having sufficiently caught the flying bug, the Johnsons put Osa's Ark in dry dock, re-christened the giraffe airplane the Spirit of Africa & Borneo and headed back to British North Borneo which they had first visited in 1920. The outstanding accomplishments and legacy of Martin and Osa Johnson - their films, photographs, expedition reports, correspondence and personal memorabilia - are housed at The Martin and Osa Johnson Museum in Chanute, Kansas and this exhibition was curated by Safari Museum Staff. The "Flying Safari," which involved traveling 60,000 miles, stretched the length of Africa from Cape Town to Cairo and is covered in Martin's classic 1935 book Over African Jungles and in their Hollywood feature film, Baboona, released in the same year.